Well, I've spent some time listening to Alibaba's third quarter, fairy tale earnings call yesterday. What an incredible, surreal experience it was. Over the years, I've been privy to more investor calls than I care to remember, but I must say, yesterday's BABA call was one of the most hollow displays of misdirection and lack of content in recent memory. After the call, I pulled the 6K just to get a little more lack of detail on what the "team" didn't seem to be talking about. In his opening remarks, Joe Tsai felt compelled to comment on the government report accusing BABA of a less than committed effort to protect consumers from fraudulent sellers and counterfeit goods. Joe began a carefully scripted, motivational rant on how Alibaba was absolutely committed to a fair and transparent marketplace. While he was talking, I pulled up the Alibaba websites and again confirmed that any knucklehead with a browser could still purchases cases of "Rolexable" watches and "Kelvin Klein" jackets for $5.00 each. Ironic at best. The softball, "atta-boy" questions posed by the "analysts", all of whom, as far as I could tell were employed by the underwriters of the IPO, were largely irrelevant and congratulatory in tone. The 6K was shocking in it's brevity....only 19 pages. The IPO filing was more than 500 pages of obfuscation. When compared to the prior filings, this was a cliff notes version. There was no mention (either on the call or in the 6K) of the progress made integrating the US10 Billion acquisitions/folly perpetrated in the last nine months and described in the September quarter filing. UCWeb, OneTouch, ChinaVision, Weibo, TangoMe, AutoNavi, InTime, Youku Tudou, Wasu, Evergrande, ChinaSmart, Haier, Singapore Post, Alibaba Health, & Beijing Shiji did not merit even a footnote, yet these are significant investments where the only disclosures in previous filings indicate that they are currently not producing revenue and are eroding the groups profitability. The word Alipay appears a total of four (4) times in the filing with no mention of either the fees paid by Alibaba to Alipay for escrow services, nor the profit sharing revenue attributable to Alibaba by the Agreement described in the IPO filing. Since Alipay is reputed to be "the largest payment processor in China", with a significant impact on the group's results, it would be appropriate to discuss the fees and revenues attributable to this agreement, or at least describe where these figures are buried in the financial statements. The company awarded 4.3 billion Yuan, or 16 percent of revenue, in share-based compensation to employees of Alibaba and its payment unit, Zhejiang Ant Small & Micro Financial Services Group Co. Really? 16% of revenue in share-based compensation? 14% YTD? I guess they are taking a page out of the Goldman/JPM playbook? Finally, and to me, the most disturbing nondisclosure of the day, the Balance Sheet showed an increase in "Questionable Assets" i.e.) Goodwill, Intangible Assets, "Investments in Investees" etc., of US$ 10.7 Billion with no explanation of what the amounts relate to. This increase took place in only nine months since the March 31st 2014 audited financial statements were issued. 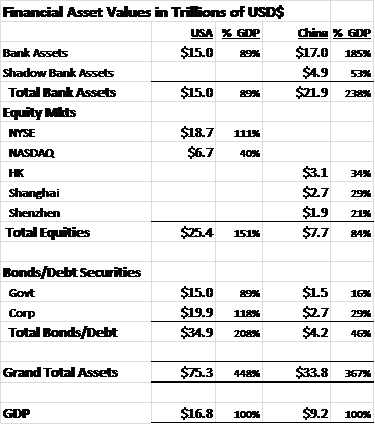 GAAP Net income available to Ordinary Shareholders for the 9 month period was US$ 3.4 Billion. If the above "Assets" (or a portion thereof) were properly expensed (which they eventually will have to be) Alibaba would have posted a Net Loss of US$ 7.3 Billion for the 9 month period ended 12/31/14 rather than the US$ 3.4 Billion Net Income reported. Even if a portion of these "masked" expense capitalizations are legitimate, Alibaba is still, in actuality, losing significant amounts of money. Earnings growth has not only slowed, these unaudited figures suggest that earnings never existed in the first place. To the casual observer, the above level of mis-rep would be nearly comical, but after this weeks US$ 30 billion reduction in Market Cap, I doubt that Alibaba investors are amused. Unfortunately, in this fairy tale, it looks like Alibaba investors aren't going to live happily ever after. The more I dig into this, the more convoluted and disturbing it gets. Let's start at what I consider the beginning, at least for me, of this discovery......do you remember a CBS 60 Minutes piece back in 2013 where Chinese economists and experts were walking through huge, vacant, buildings, construction projects and cities? (link posted below) The theme of the segment was generally "How could this happen and when/how will it end?" If you haven't seen the piece, or don't remember it, you should probably view it before reading on. Did you view it?.....good....Ok....here we go. Keep what you've just seen in the back of your mind. 1.) China is the only major economy where bank deposits have never been backed by a specific/explicit Central Bank Guarantee. The thinking was, and still is. that Chinese Banks are/were, for the most part, heavily regulated, State Owned Enterprises (SOEs) which had an implied right to be bailed out in the event of a problem. Depositors have always believed that principal is never at risk and they will always be made whole. 2.) Over the last few years, as depositors reached for higher interest rates, unregulated Shadow Banks have popped up everywhere. Now, credit is available from a range of alternative entities, such as trusts, credit-guarantee businesses, crowd-funding and "money-market" funds, to name a few. Today, Chinese Shadow Banking assets have grown to about US$ 4.9 Trillion, or the equivalent of about one-fourth of China's formal banking sector, according to the Chinese Academy of Social Sciences & ANZ Bank, Or to put it another way, Shadow Bank assets are now more than 50% of China's GDP. 3.) To add additional perspective, the "Big 5" State owned Chinese Banks ( Industrial and Commercial Bank of China, China Construction Bank, Bank of China, Agricultural Bank of China and Bank of Communications) as of June 2014 had total assets of just over US$ 12.2 Trillion. All Other Chinese banks had total assets of just over US$ 5 Trillion. 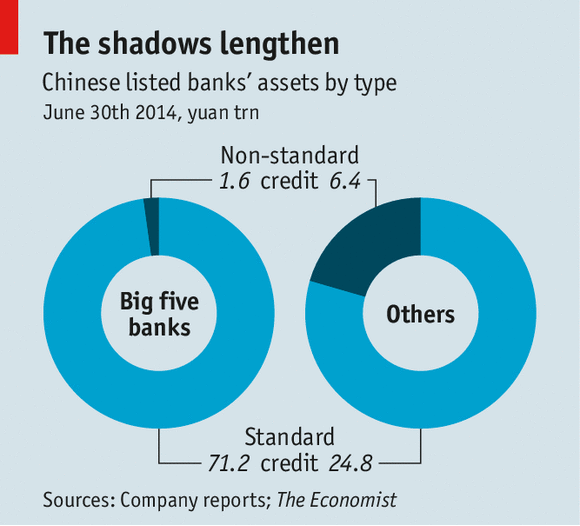 Again, Shadow Bank Assets are now as large as "All Other Bank" Assets. 4.) Non-Standard loans have also ballooned as described in the Economist chart below. Roughly 2% of the "Big 5" bank's assets are considered Non-Standard whereas 20% "All Other" bank assets are now considered Non-Standard by definition. By that same definition, the entire US$ 4.9 Trillion Shadow Bank Asset Class, the equivalent of "Other Bank Assets" would also be considered Non-Standard. Presumably, if a borrower was "bankable" or "Standard" they would have no need to borrow from a Shadow bank at an interest rate several multiples above current bank rates. 5.) China's M2 has also expanded dramatically over the last few years. China's M2 has increased by the equivalent of US$ 2 Trillion in 2014 (about 20% of China's GDP). by comparison, US M2 has increased by roughly US 600 Billion (about 4% of US GDP) over the same period. Moreover, China's M2 is huge compared to the US, running about 220% of GDP vs. 70% for the US today. Oddly, even with the meteoric growth of China's money supply, the exchange rate has remained relatively constant with the CNY remaining in a range between 6.10 to 6.20 per US$ during that time. 6.) Curiously, even with the substantial increase in the money supply, inflation is actually on the decline, The inflation rate in China was recorded at 1.40% in November of 2014, down from 2.50% a year ago, as reported by the National Bureau of Statistics of China. One possible and likely explanation for this is that Consumption isn't increasing nearly as fast as the money supply. There's little/no increased price pressure since the increased money supply is being funneled directly into bank and Shadow Bank deposits, rather than spent on goods and services. 7.) One year bank deposit rates are currently running about 3.3% with interest rates on one year bank loans running about 5.6% and the spread has been narrowing. Bank underwriting guidelines are still relatively tight on consumer/retail and small business loans. Historically, credit has been used sparingly. Consumption has increased slightly over the years, but as mentioned above, the Chinese Consumer has traditionally been more predisposed to saving rather than borrowing/spending. 8.) With the promise of higher interest rates, crowd-funding, trusts, Trust Beneficiary Rights products (TBRs), et al have been developed as alternative investment vehicles, usually collateralized by land, real estate or "business interests". These "investments" usually promise 10%-15% annual returns and have been a hot alternative to the 3% returns generated by traditional bank deposits. 9.) These products have been so successful that they've sprung up everywhere. Alibaba/Alipay (BABA:NYSE) Tencent (700:HK), Soufun (SFUN:NYSE), JD.com (JD:NASDAQ), Yangzijiang Shipbuilding (YZJSGD:SP), China Credit Trust, ,Zhejiang Xingrun Real Estate, just to name a few of the larger players all run these websites. There are hundreds, perhaps thousands, of websites which make it very easy to use Alipay (China's version of PayPal), debit cards or bank accounts to instantly complete balance transfers to these "investment vehicles". An informal survey of some of my friends in China tells me that it's common to use Alipay to transfer money (sometimes more than half of their monthly income) in and out of these investment choices. The Chinese people trust them. (see list of 'investment" websites below. Few, if any, of these sites existed five years ago) Moreover, new Shadow Bank loans have increased dramatically while traditional, properly underwritten, bank loans have actually decreased as described in the Economist chart below. 10.) The first larger defaults of these non-bank trust investments occurred in mid 2014 with China Credit Trust (CCT)'s "Credit Equals Gold" products, causing the trust to renegotiate the terms, forgo interest and restructure principal payments. There will be more to follow. 11.) Many of these "Investment" websites, in my opinion, are actually pretty comical. I'm not sure who would actually invest in these things. There are graphics of stacks of money and bags of cash, "15% GUARANTEED RETURN", luxury properties, fast cars and attractive women. They proclaim that hundreds of thousands of investors have received millions of dollars in returns and they have a "0% default" rate. There's no detail re: the products or investments. Yet, people seem to be "clicking" money into these products at a breakneck pace. If you can't read Chinese, Google translator is not perfect, but very helpful. Again, most of the websites have lots of pictures of luxury homes and buildings promising 15%+ returns. (Now visualize the "vacant cities" from the CBS 60 Minutes Piece). The more more popular sites are listed below at the end of this post. 12.) There has also been a significant inflow from US Capital markets. As of 12/31/14 there were 107 Chinese ADR's listed on the NYSE and the NASDAQ. The aggregate Market Cap of these businesses is US$ 1.316 Trillion (about 15% of China's GDP). There are another 196 Chinese ADR's traded OTC (Market Cap TBD). Based on what I'm seeing, it's unlikely, at best, that these securities are properly priced. 13.) According to the Bank for International Settlements (BIS), Chinese debt securities issued (all issuers) have increased 12% by about US$500 Billion from January 2013 to June of 2014. About half of this increase was in Government Bonds. By comparison, US Debt securities outstanding increased by 4.8% during the same period. Here's a list of financial assets comparing the US and China. As you can see the asset composition, especially when compared to GDP, is much different. China is "Bank Account Rich" and "Stock/Bond Poor" when compared to the US. I can't say whether this is good or bad......it just "is what it is". When examining the valuation risk of each asset class we can infer that the risk of default would be greatest on the least regulated class. In most cases, (before inflation) bonds and cash don't lose principal. Equities, of course, regularly gain and/or lose value. Loans, however, depending on underwriting discipline, as we know all too well from our experiences in 2009, can go bad in relatively short order. Loans must be backed by assets that generate sufficient income to service the loan, which unfortunately, most of the Shadow Bank assets don't have. Hypothetically speaking, what would happen if the entire US$4.9 Trillion of brand-spanking-new Chinese Shadow Bank Assets (50% of GDP) had to be written down/off? What if the world's second largest economy suffered a Bear Stearns moment? What might happen to the US$ 25.4 Trillion Stock Market(s) as everyone runs for cover? Again, visualize all of those vacant buildings and misguided construction projects languishing with no prospect of ever producing any income. 14.) Finally, under the heading "Too Little too Late'. The PBOC currently has proposed the first deposit guarantee agreement for the Chinese people.. Generally, the PBOC will guarantee depositor funds in PBOC banks up to US$ 81,000, effectively guaranteeing 99% of all bank deposits. The deposit insurance is set to be implemented sometime n 2015. Shadow Bank funds would, of course, remain uninsured. Oddly enough, this may make matters even worse. Once the run on the Shadow Banks starts, Chinese investors will be able to move money to the new, perceived safety of insured accounts much more quickly and confidently than they had in the past. Now let's think back again to all of those construction projects and abandoned/unoccupied new cities in the CBS 60 Minutes piece. Let's look at all of the "cool" pictures of luxury condos and office buildings depicted on the websites offering 10%+ (3x the bank interest rate) returns if you just tie up your money for a few years. The only reason the projects haven't been written off/down is that 1.) The New Shadow Banks,; 2.) The US Equity Markets; and 3.) A huge increase in the Money Supply have allowed the project promoters and financiers to kick the proverbial can down the road. To the Chinese people, everything will look just fine.... until it's not. It's likely that many of these Shadow Banks are nothing more than mismanaged Ponzi Schemes unable to generate returns which would cover their overhead and 10%-15% interest cost. Everything seems just wonderful to the naive "investor" since they are receiving a 10% return paid out of someone else's principal. Everything will work as long as the money keeps rolling in. At some point however, the money will start flowing out. Like all Ponzi's, there will be a day when one default causes another and another. The good Chinese people will get a dose of capitalism in its' purest form....a loss of hard earned savings. Once the hard working, trusting, good Chinese people begin to see that their savings have been used/stolen to finance failed/failing construction projects, which none of the banks would touch, they will immediately begin to move money back into the new "guaranteed" safety of the PBOC banking system. This will spell the end for most of the Shadow Banks....and that, my good friends, will be that. Now, let's get back to Alibaba (BABA). the greatest Shadow Bank in history and the original impetus behind this post. Notably, Alipay was spun off in 2011 and was not a part of the US IPO, so there is no verified, public information on volume, sales/revenue or profitability of the business, other than the rantings of Mr. Ma, which frankly are simply not believable. Prior to 2010, the Revenue, Expense and Income numbers for Alipay, SMFSC and affiliates on the Consolidated BABA financials were what amounted to a "rounding error". 1.) Alipay is huge....it's ubiquitous in China. Mr. Ma claims more than "900 million active accounts". Informal surveys indicate that most of the Alipay transaction volume (60%-70%) is comprised of balance transfers, utility bill payments, credit card payments and "investments". 2.) Alipay is primarily used to move money between accounts since it's not a credit card, nor is it accepted at POS for retail purchases. Yet, its' growth (along with M2 and Shadow Bank Assets) has been enormous. 3.) Alipay is owned/run by Small and Micro Financial Services Company, one of the 290 "related" entities in the BABA VIE. (Variable Interest Entity) substantially controlled by Mr. Ma. 5.) Shortly after the September 2014 IPO, the China Banking Regulatory Commission approved a bank with four founders including another BABA VIE ,Zhejiang Ant Small & Micro Financial Services Group Co. , according to a statement posted on the regulator’s website the new bank will be called Zhejiang MYbank Co. in English, according to a Zhejiang Ant spokesperson. 6.) Alibaba’s Zhejiang Ant Small & Micro Financial Services Group Co. , already owns a small-business lender, a money-market fund known as Yu’E Bao. As of October of 2014 Yu’E Bao had US$ 81 Billion in assets under management and is described in the Alibaba press release as "the World's fourth largest Money Market Fund". Yu’E Bao invests mainly in structured deposits, ie, money-market funds, but also in sovereign debt, Bank Acceptance Notes (BAN's), finance bonds, and inter-bank assets. This roughly US$ 80 Billion increase in the Yu’E Bao coffers happened in an astonishing nine (9) months. "Alibaba Group Holding Ltd. (BABA)’s finance arm aims to create a marketplace for 1 trillion yuan (US$163 billion) of loans in as soon as two years as the e-commerce group encourages more Chinese to borrow and lend." 8.) We can assume that Alipay (and affiliated VIE's) are conduits holding vast sums of unregulated, unaccounted for, un-audited escrow or "money market" funds. Hypothetically, what if the banks given the fiduciary responsibility of verifying the credit worthiness of the borrowers and "making sure the money would be paid back", already had a relationship with the borrower they are certifying and were simply trying to transfer or "securitize" a future bad debt to an unsuspecting "investor" in exchange for a fee? Again, we've seen a much more sophisticated variation of this in the US and as we all know, it didn't work out too well. So there you have it......Alibaba isn't an E-Commerce Company at all. They are the largest, unregulated Shadow Bank in the history of global finance. Now, the US$ 5 Trillion question....and I think than number is about right.....how long can this possibly go on? Like any Ponzi scheme, Alibaba should be able to keep juggling for quite some time based on the amount of money they have coming in. If all goes well for the Ponzis, when paying interest at 10% in arrears, it can take a decade before principal is exhausted, unless of course, the Chinese people figure this out sooner. However, because of the enormity of these numbers, the hope for some sort of a soft landing is no longer realistic. The global financial system is at now officially at risk. I can hardly wait to wee what happens next. Tencent's investments are through WeChat, it's WatsApp-style system. Investments are purchased via smart phone.